Pushcart Prize-nominated horror author Devan Sagliani will sign the bind-up edition of his bestselling ZOMBIE ATTACK! young adult duology on Saturday, Jan. 17, from 11 am. to 3 p.m. at Barnes & Noble bookstore located at the 3rd Street Promenade in Santa Monica. Sagliani’s ZOMBIE ATTACK! novels, RISE OF THE HORDE and ARMY OF THE DEAD, published by Permuted Press, have been well-received by young adult readers. In RISE OF THE HORDE (ZOMBIE ATTACK!, #1), California teen Xander MacNamara is left at Vandenberg Airforce Base in Santa Barbara by his older brother, Moto, with instructions to stay put no matter what happens. When a group of zombies invade, Xander is forced to flee the base and travel south to reunite with Moto at Port Hueneme. Armed with nothing but his martial arts training and katana blade, Xander fights for his life against neo-Nazis, outlaw bikers, cannibals, cult members, and flesh-hungry zombies. The adventure continues in ARMY OF THE DEAD (ZOMBIE ATTACK!, #2), which opens with Xander as the Civil Defense Coordinator in charge of a post-apocalyptic civilian colony outside of Barstow. He and his young wife are forced to deal with reconstruction, a sadistic cannibal tribe and the threat of genetically engineered super zombies. This author signing event is free to the public. 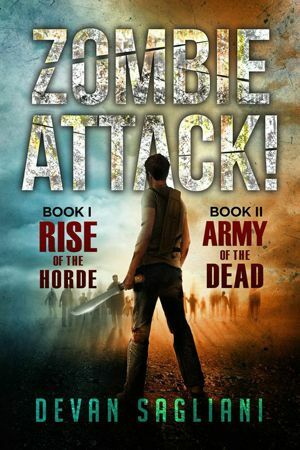 ZOMBIE ATTACK!1 & 2:RISE OF THE HORDE/ARMY OF THE DEAD bind-up editionis available in both print and digital formats via Barnes & Noble http://www.barnesandnoble.com/w/zombie-attack-1-and-2-dev…. Discover the horror fiction of Devan Sagliani viawww.devansagliani.com and Permuted Press http://permutedpress.com/authors/devan-sagliani.